Rishtan is the oldest centre of ceramic art in Central Asia. 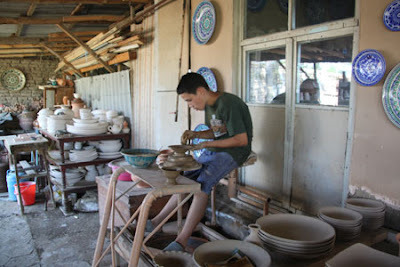 The famous technique of glazed earthenware, which local people use for their household needs and which is exported from the Ferghana Valley, was created here. It varies by shape, ornamentation and colour. The most characteristic colouring is a turquoise, dark blue and brown scheme on a milky-white background. Ishkor glaze, made from ashes, gives the earthenware its beautiful, soft shine. Today there are around 2,000 potters in the Rishtan region, many of whose families have been working in ceramics for generations. Sarah Archer has published a most interesting photo essay Out of the Ashes in Hand/Eye magazine. 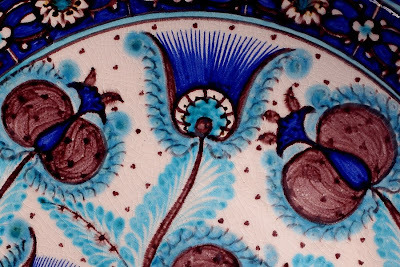 Along with the slide show, the article provides a comprehensive overview of Rishtan's unique ceramics, focusing on the work of Rustam Usmanov. While on Hand/Eye's site, take a look at Clare Brett Smith's earlier piece on Rishtan ceramics, Bowled Over, accompanied by Edward Addeo's luscious photographs. Uzbek Journeys excursions to Ferghana include visits to the Usmanov workshop as well as Alisher Nazirov's atelier. Tip: bring your own bubble wrap to protect your purchases. It is unavailable in Uzbekistan. If you're not travelling in the region, over at Made and Told you can purchase a beautiful platter from Rustam Usmanov online.